Way back when Captain Underpants was a little baby just starting to eat solid food, I found out that he had an intolerance to rice cereal. It made him cry, gave him hideous gas, just basically made his life miserable. The only grain I could give him as a baby was oatmeal. 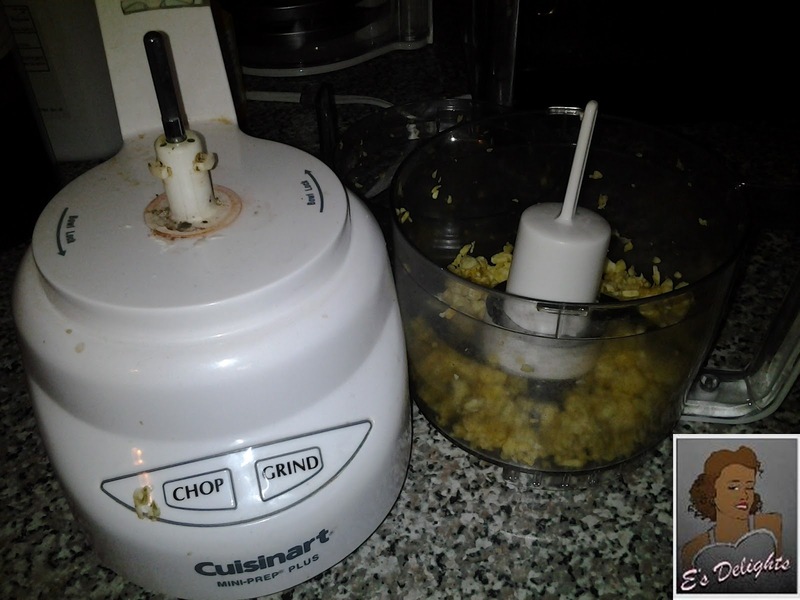 Well, baby oatmeal is boring so of course I mixed stuff in it, like every other mommy. I mixed bananas (gag! ), peaches (double gag!) and applesauce. I put in cinnamon and a hint of brown sugar. I got fancy with my 7-month old baby because, gee, I didn't know any better and I only had the one kid. Fast forward 8 years. My oldest still eats oatmeal. But now, he will ONLY eat it with applesauce, cinnamon, and a hint of brown sugar. Oh, and he wants it NOW! Oh and he wants vast quantities of it because he is almost as tall as I am and close to 70 pounds now. Fan-tastic. 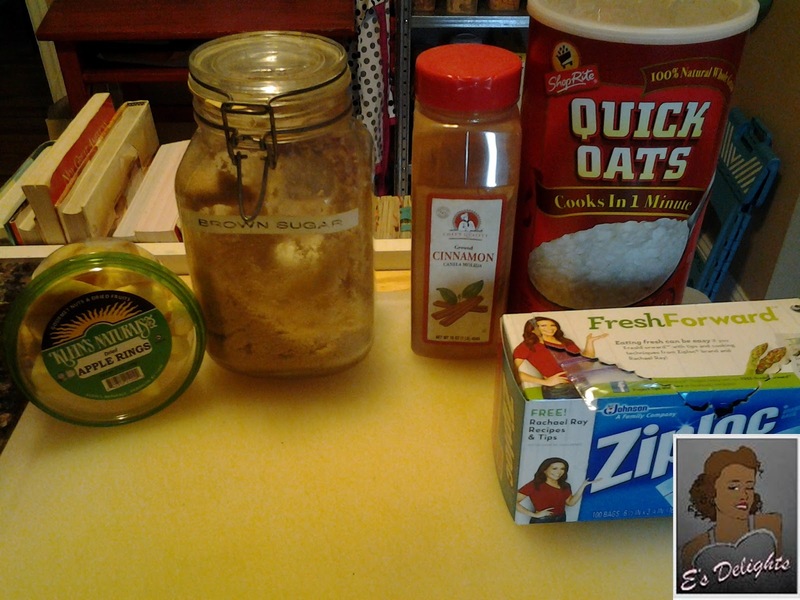 So I started buying Quaker Instant Apple & Cinnamon oatmeal every time I went shopping. The only problem is that this quickly got expensive and Captain Underpants started downing 2 packets of oatmeal at a time. Thriftily I changed to the store-brand version of Apples & Cinnamon oatmeal. Unfortunately, this produced a hideous side effect to the tummy of Captain Underpants. I am not sure what is IN the store-brand version, but it does not agree with my child. Finally we switched to the Organic store brand version and that helped somewhat, but we also got two less packets per box which meant more boxes to buy. I had to order some dried apples in bulk because Captain Underpants likes dried apples AND applesauce in his oatmeal. Yeah, my kid is a little complicated, but I only have myself to blame. I mean, I made pop-tarts from scratch, remember? 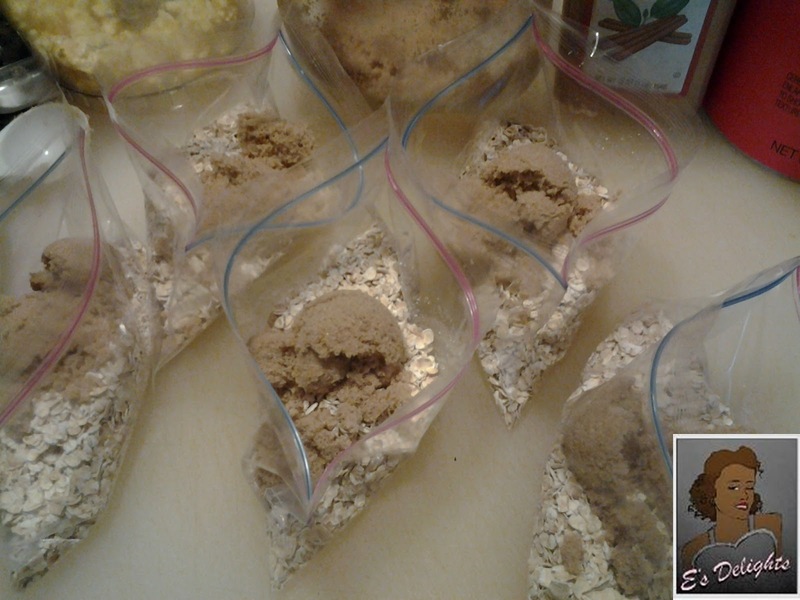 I used a full 1/2 cup of oatmeal per baggie. This is twice the amount you get in one of those little packets from the store. I used snack-sized Ziploc bags so that there would not be a ton of extra room in the bag making the apples all stale. I put in a rounded tablespoon of brown sugar. 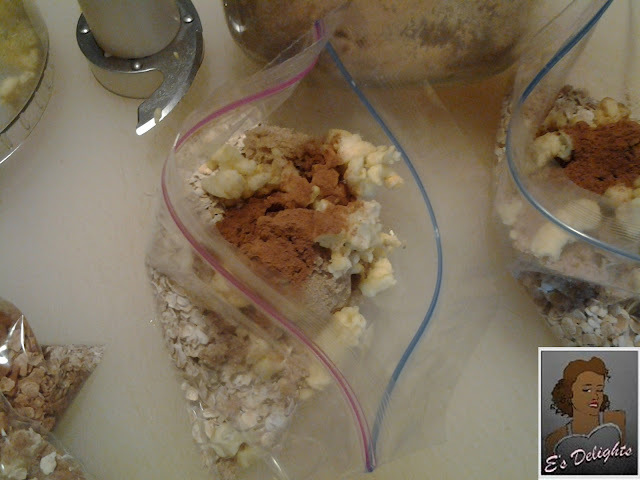 I added two tablespoons of apple bits per bag. 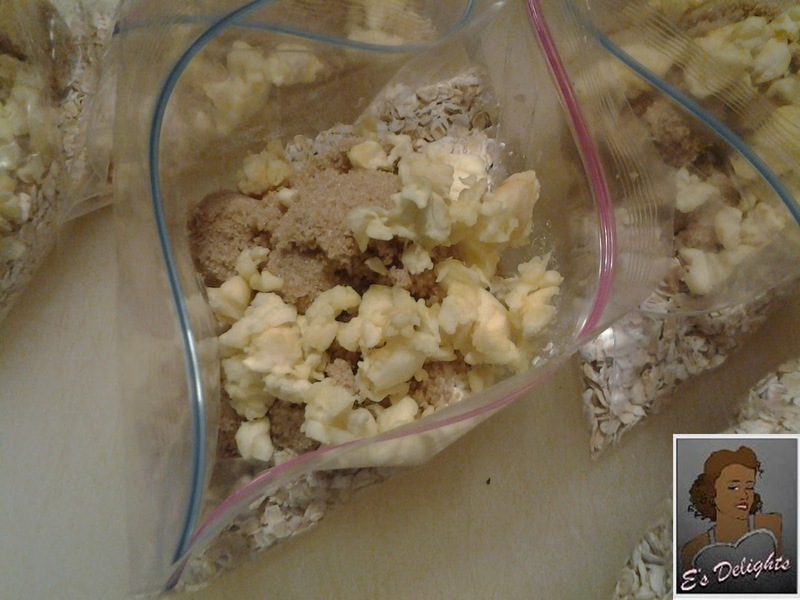 In this picture it kind of looks like popcorn, but those are truly dried apple bits. Nothing would be complete without a healthy dash of cinnamon! Did you know that cinnamon is a natural way to lower your blood pressure? The Captain will have GREAT blood pressure readings in life due to his oatmeal consumption alone. 1. I know EXACTLY what is in this stuff. Oats, brown sugar, organic dried fruit, and cinnamon. No added salt, no preservatives, nothing else that is gross. 2. Our version has a TON of dried fruit in it compared to the store bought stuff. Woo Hoo! 3. Though it looks like I am wasting a bunch of baggies, I am not. 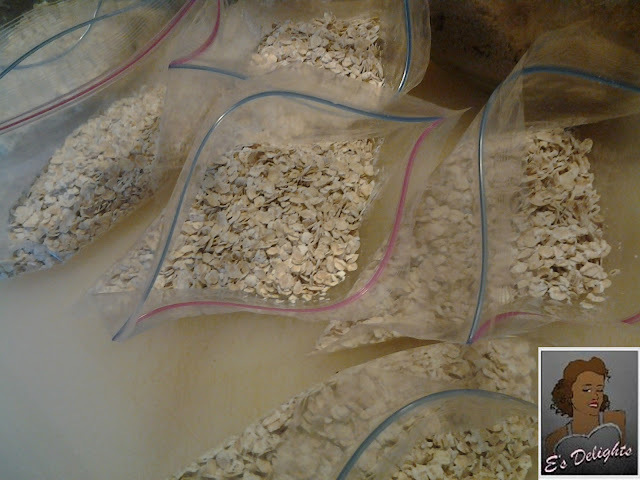 Under pain of death, I told the Captain to save every one of those plastic bags so that I can re-use them for the next set of oatmeal packs. Mother Earth can relax a little. But the best-est reason of all? 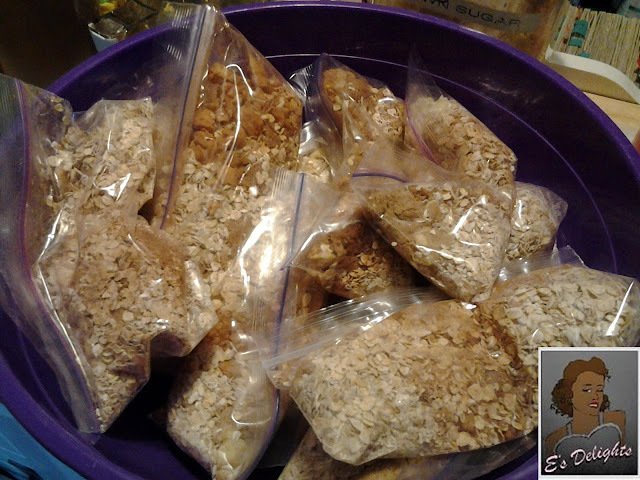 My kid thinks I am the most wonderful mommy in the world for making him "special" oatmeal packs that fill him up and won't hurt his tummy. Totally worth it right there. I'm so filled with joy that I don't even need wine. Go figure.